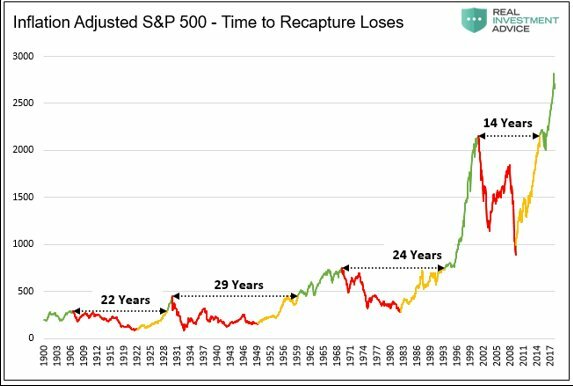 Is there anyone who would really invest willingly in a strategy that repeatedly produces negative real returns for around 14 to 29 years? These negative real return periods would also include carrying huge losses over multiple years. The chart above shows that this is what it has historically really meant to be a “passive investor” over the last 100 years. Indeed from 1900 to 1983 there was almost no real return. The older the investor, the more dangerous this approach is. For example, for a 70-year-old to wait around 20 years making no real return could be disastrous. Capital would be depleted, in the hope that an eventual rally would more than make up for it. Unfortunately, it is quite likely that whatever rally eventually materializes it would be too late to benefit the investor. Why would anyone, even the young, really choose a “passive investment strategy”? How many “passive investors” would end up bailing out of this investing strategy, at some point, given a multiyear period of losses? After all, who could really take that kind of experience? Why would anyone commit to a strategy like that if they understood it? Remarkably, the chart below shows, that today there are huge and growing numbers of investors who nonetheless say they are “passive investors”. There is a record number of them and that number is growing fast across the globe! “Active equity managers continued to lose ground to index funds last year, as U.S. investors poured $470 billion into passive equity strategies, according to Morningstar. 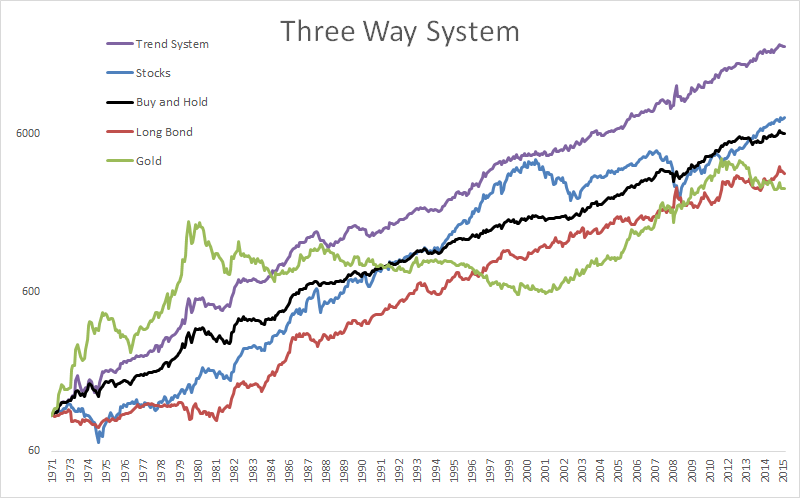 For sure, well executed trend following systems can be a very successful investment strategy. However, this involves a sell discipline, which is entirely ignored by “passive investing”. This is a huge difference. Perhaps passive investors have just become conditioned to the long-term uptrend in US equities since 2009 and have overlooked the necessity of a well chosen sell strategy. Sole reliance on an everlasting equity bull market has never worked before, and is unlikely to have started working in 2009. The chart above shows that the current rally has already been one of the biggest in history. This most likely means that we are now nearer the end of the rally than the beginning. The chart below shows the valuation extremes in 1929 and 2000 and now! 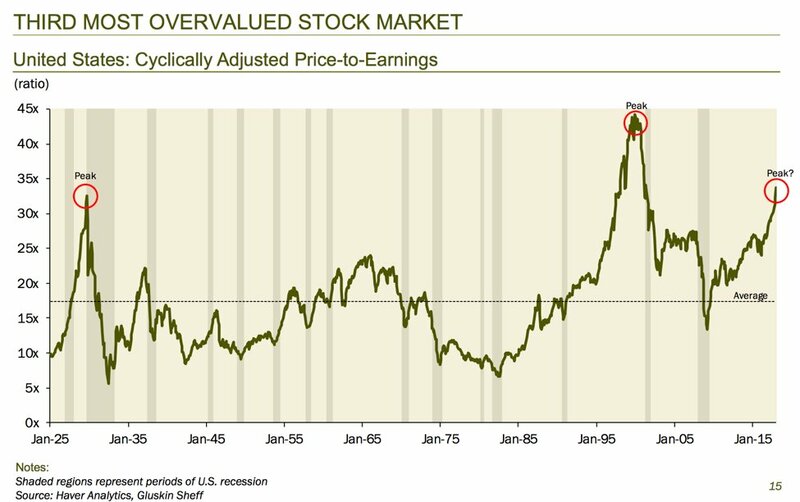 The last 2 times we had an overvalued stock market like now coincided with a 29 year and 14 year negative real return period. Investors should be running away from “passive” strategies right now instead of rushing into them! I believe a far better approach is to find a system that will permit positive returns on a consistent basis year in year out, regardless of which asset class is performing well. Investors might be surprised how simple it is to make an improvement. Here is an example, for educational insight purposes, that demonstrates how simple that could be to implement. “Three asset classes: Stocks, bonds, gold. Invest equally in whatever is going up (defined as 3 month SMA > 10 month SMA). As the results show below the Trend System outperforms for over 40 years, all the other individual asset classes, with lower volatility, lower Max Drawdown, and also a higher Sharpe ratio. 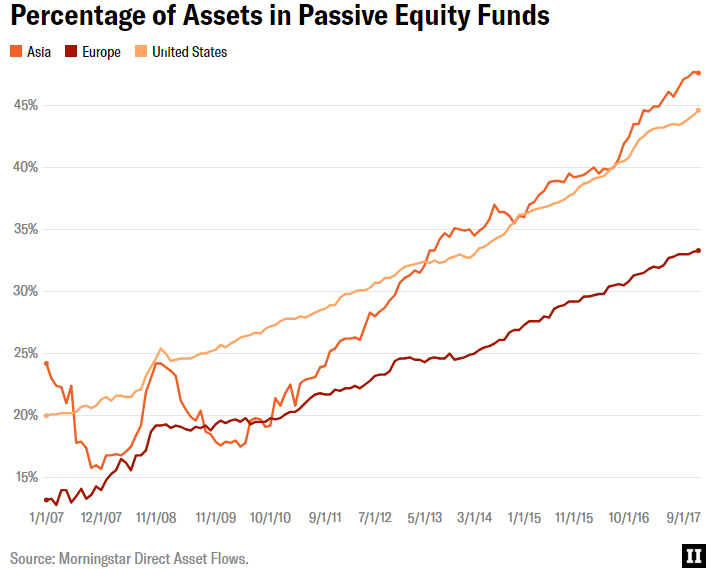 “Passive” has now become such a large component of investor funds that, in a strange way, it has become a dominant market factor. Here are a number of articles that are trying to make sense of what this major new trend actually means. There is clearly a great deal of confusion in asset allocation discussions about what it means to have a “passive investment strategy”. Let’s go back to the basics. Being passive means buying and holding pooled assets for the long term, with no sell strategy or systematic reallocation. It is a lazy idea that doing nothing with a certain type of set up will work out fine. Sometimes it can seem like that, but it is a little like saying there is a silver bullet that will cover all life’s outcomes without any attention required. If you want to buy into that approach then that is your choice. Good luck! My recommendation is that investors should avoid anything “passive” and fast. “Passive” is at best a very poor strategy, which currently could be disastrous for investors at today’s valuations. Just a little work can transform your investment prospects.